The Portal Settings page is broken into six categories: Billing Settings, Order/Ticket Settings, Freight Settings, Load-Out Settings, Other Settings, and Password/Security Settings. 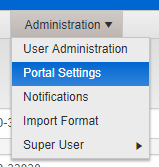 To access your Web Portal settings, navigate to Administration >> Portal Settings. NOTE: These settings will be defined during the upfront setup of your company and should rarely be edited. Starting invoice #: Defines the starting invoice number to be used during Billing. Default Invoice Break: Defines when to create a new invoice number for a group of tickets. Customer – Assigns all tickets within a batch to a single customer. This allows you to create a single invoice across multiple orders. Customer/Order – Creates a new invoice number for each customer order. Customer /PO – Creates a new invoice number for each customer purchase order established on an order. Billing Export Format: Choose your third-party accounting system to define how Fast-Weigh billing data will interface with your accounting system. Optional Invoice Prefix: If using direct accounting integration, you may add a short prefix to your invoices to avoid any duplicate invoice numbers being created in your third-party accounting system. Company Codes: This three-digit company code corresponds to the one used with your accounting system. If your accounting system doesn't use a 3-digit company code, you can simply use the first three letters of your company name for the company code. GL AR Account: Corresponds to the GL AR Account used in your third party accounting system. AR tax code: Corresponds to the AR tax code used in your third party accounting system. Units of Measure: Define global units of measure to be used during product setup. Click the [ User-Defined Fields ] button. > Create up to three custom fields to be used while ticketing. Label each field here, and then go to Devices to configure and enable the Ticket UDFs on your ticketing device(s). These fields will be printed on your tickets. > Check the "Used" box and full out the remaining parameters to use these UDFs under Ticket Entry on the portal as well. > Checking "Required" forces the app user to enter something in the field. > Checking Validated and entering comma-separated (no spaces!) values in the field below will create a drop-down menu with preset values. > Click Save when done. > Up to three custom fields can be added to your orders. > Check the "Used" box to enable this UDF. > Set the Type to Alpha to allow both letters and numbers in the field. Set it to Numeric for numbers only. 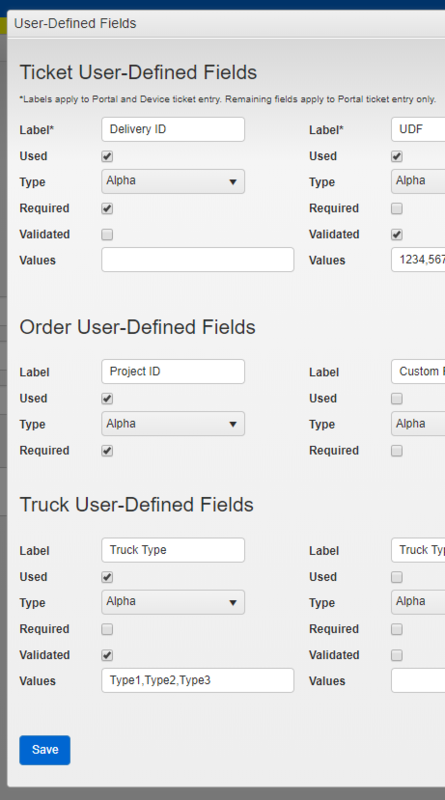 > Up to three custom fields can be added to your truck profiles. Freight Code Our Truck: If your third-party accounting system uses a product code or SKU for your freight rates, you may put that code here. 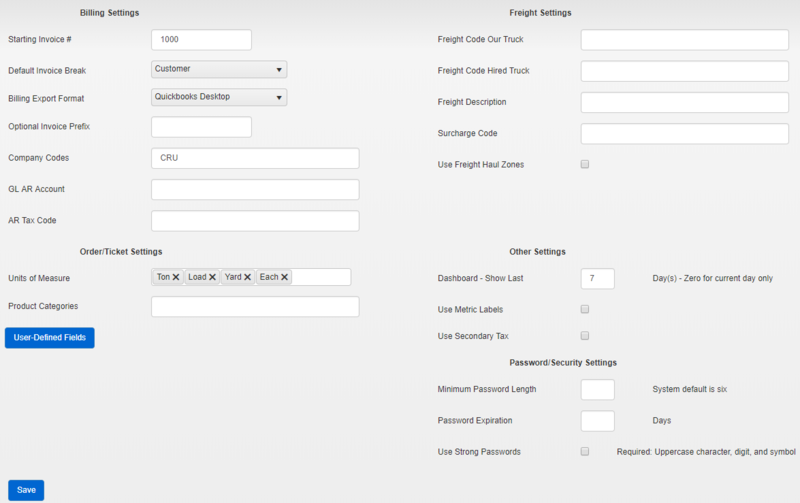 Freight Code Hired Truck: If your third-party accounting system uses a product code for your Hauler rates, you may put that code here. Freight Description: Optional description field to correspond with description for any freight rate product or SKU set up in your third-party accounting system. Use Freight Haul Zones: Check this box to use Haul Zones when building orders. NOTE: Freight rates, hauler rates, and surcharges are set up when building orders. Dashboard – Show Last: Choose how many days by default the dashboard data shows. Setting zero results in current day data only. Use Metric Labels: Switches U.S. Imperial measurement units to Metric units. Use Secondary Tax: Check this box to enable Secondary Tax codes. Password Expiration: Set a password expiration date, which forces users to change their passwords at that time. Use Strong Passwords: Check this box to force users to make their passwords contain various special characters for better security. Once you have finished modifying your portal settings, click Save to avoid losing changes.